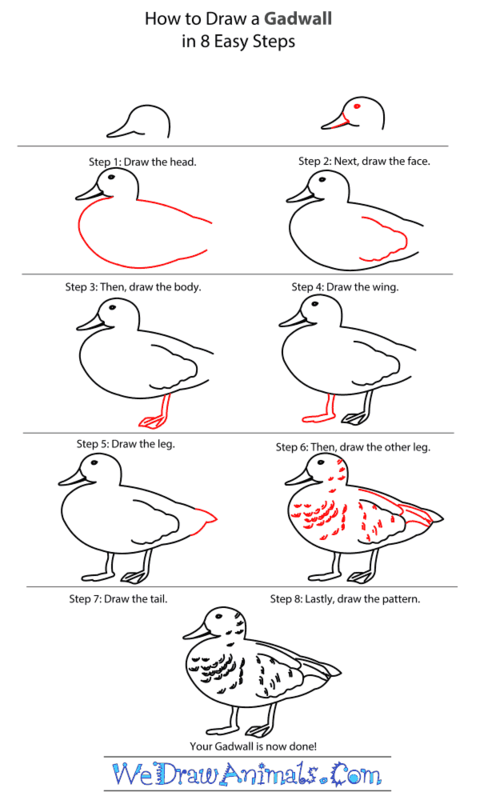 In this quick tutorial you'll learn how to draw a Gadwall in 8 easy steps - great for kids and novice artists. At the bottom you can read some interesting facts about the Gadwall. Step 1: For the head, draw a circle with two curves meeting in a point on one side of it. Add a small curve coming down on the opposite side for the neck. Step 2: Add a small seed shape in the top for the eye. 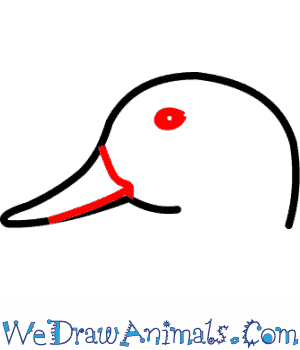 Also add a line that closes off the beak, and then turns into it to define the mouth. 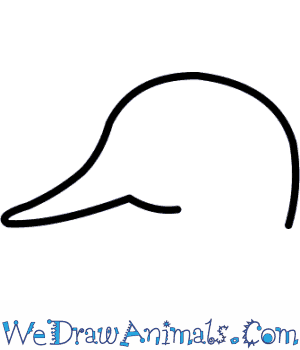 Step 3: Under the head, draw a sideways pear shape, with the narrow end pointing back, for the body. Leave a gap at the back for the tail. 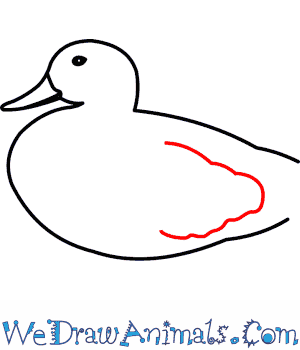 Step 4: Draw a curvy, sideways V inside the body for the wing. Step 5: Under the middle of the body, draw two lines going straight down, ending in a triangle. Add three angled lines in the triangular foot to define toes. Step 6: Next to the first foot, draw two lines coming down, which then bend to make a backwards L-shape. Step 7: Close off the tail with a V-shape, the bottom of which bends and curves slightly. Step 8: Draw a few lines on the back and tail. Add a bunch of small curves and lines over the rest of the body. Done! 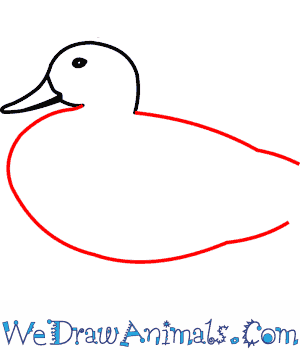 You can color the beak and feet dark orange. 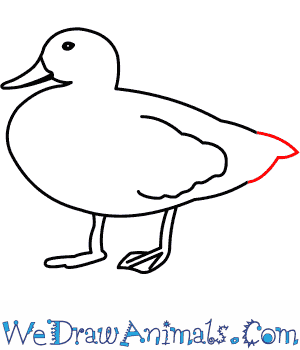 You can color the body either grey with a black rear end and white wingtips, (male) or light brown with dark brown spots and white wingtips (female). 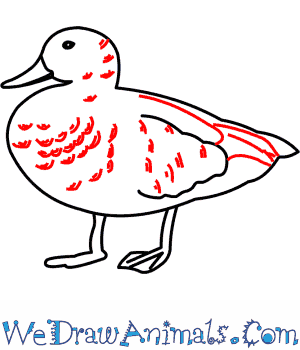 The Gadwall is a member of the bird group and the scientific term for them is Anas strepera. 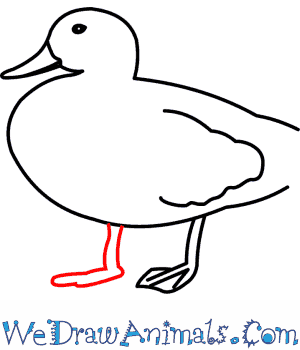 This animal is in the Anatidae family, which consists of ducks, geese, and swans, which is found on every continent except for Antarctica. Males of this species are grey with a black and white tail, an orange beak and legs, while females are the same but with a brown body. This animal was first documented in 1758. This creature is almost 2 feet in length. The closest relative of this species became extinct in 1874. Their weight is up to over 2 pounds. The name of this animal was first used in 1666. This species creates its nest out of feathers, and is socially very quiet, except during mating season. 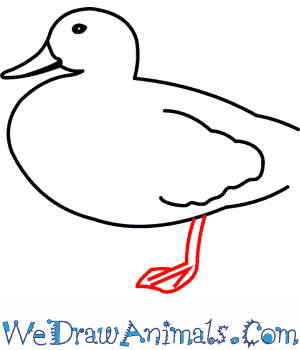 The bird makes its home on open wetlands which includes prairie or steppe lakes, wet grassland or marshes. It feeds by foraging for plant food with its head under water. 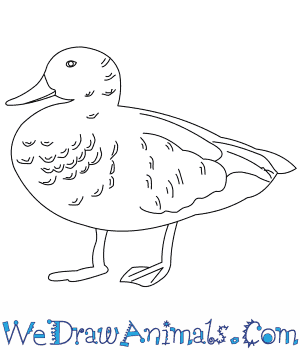 They are not as social as some ducks are outside of the breeding season, and they tend to form small flocks. These animals have a low population amount, but are considered to be the least concern for the possibility of extinction.